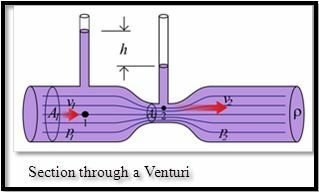 Venturi injection requires a pump to move biomass through a specially constructed pipe that effects a gradual constriction immediately proceeded by a return to the original pipe diameter. At the constriction, the water pressure drops, creating a vacuum. By attaching an external tube to the constriction point, air will be drawn into the resulting vacuum. The combination of pipe, constriction throat and external tube is called a venturi. This method of aeration has been popular because of its apparent simplicity. The rate at which dissolved oxygen can make contact with all areas of the bioreactor is dependent on the pump flow rate and the venturi size. Venturi aeration requires considerable pumping capacity to achieve optimal oxygen transfer. 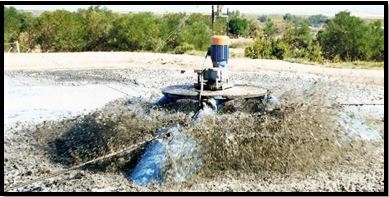 Surface aeration is the method by which the surface of the bioreactor is agitated from a mechanical paddle arrangement. Surface aerators can be mounted on floating or fixed platforms. The resultant aeration zone created by surface aeration tends to be localized at the mechanical paddles. Surface aeration is an economical method to aerate a large body of water such as a dam or pond. For a bioreactor using surface aeration, the geometry of the bioreactor is extremely important. To achieve good oxygen transfer the bioreactor needs to be cylindrical in shape with a slightly coned shaped base. Fine bubble diffused aeration makes use of an air blower and diffuser dome arrangement. This method achieves a good oxygen transfer efficiency in almost any shaped bioreactor. Microscopic sized pores on the diffuser split the air supply into a multitude of minute gaseous streams. When comparing different aeration techniques, oxygen transfer efficiency is an important yardstick. Aeration systems are usually rated by the mass of oxygen transferred per kilowatt hour. The more oxygen transferred per kilowatt hour, the more energy efficient the system. Because it is difficult to get dissolved oxygen into the bioreactor a lot of energy is lost in the process of oxygen transfer. Big bubbles do not necessarily translate to dissolved oxygen. As with all systems, different aeration techniques have advantages and disadvantages. The table below gives an indication of the practical aspects of each aeration technique. There is not just one aeration system that can be used for all cellars. Each aeration system requires careful engineering considerations. The table below provides a rough placement guide for cellars. As mentioned above, the relationship between oxygen demand and dissolved organic material is linear. Not surprisingly the oxygen demand increases as cellar production increases. The table below shows typical peak oxygen requirements and compares the installed power requirements for each aeration technique. When choosing an aeration system, it is important to know the oxygen demand. This information is usually calculated by the supplier of the aeration system. When comparing aeration systems it is therefore of great importance to know that each system delivers the same amount of oxygen.